J. T. Noblin: The Man. The Myth. The Legend. 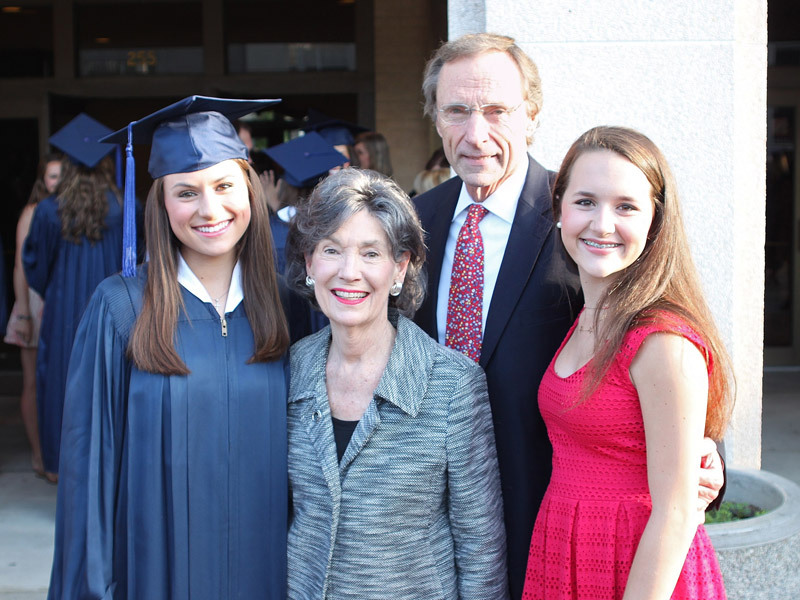 Photo of J. T., his wife, Larry, and granddaughters Keavy and Clayton at Keavy’s high school graduation. We knew the day would come, and yet we were unprepared. When J. T. Noblin announced his retirement to the Judges of the Southern District, the faces at the table said it all. You’ve seen happier people around a platter of liver at Thanksgiving. Running the Court without J. T. is like starting a fire with flint — theoretically possible, but few have seen it done. He was only appointed in 1990; wasn’t he supposed to stay forever? Ah, the “other duties.” In J. T.’s case, they have ranged from the inconceivable to the … well … more inconceivable. His tenure as Clerk has definitely had a Water Theme. The old federal courthouse in Jackson tortured him for years with its leaky roof and ancient plumbing. Judge Lee remembers an early Saturday morning call from J. T. to let him know that his chambers had been deluged by a wayward pipe. On another occasion, it was the Clerk’s office that took a direct hit from the courthouse’s water delivery system. And then there’s Colmer Lake, the attractive water feature that appeared outside the back door of the Colmer Federal Building in Hattiesburg last year. The Lake is the result of — you guessed it — leaky water pipes. Good thing they did. Georges was just a warm up for the big event, and the aftermath of Hurricane Katrina might have been J. T.’s finest hour. Or year. On the day that Katrina hit, he was the last person to leave the courthouse to go home and ride out the storm. The winds and rain scattered judges and staff around the State, to the horror of the Marshals Service, which had to track them down, one by one. A few days later, the Marshals escorted Judge Guirola and J. T. back to the Coast to survey the damage. The new courthouse had barely been open for twenty months, but Katrina’s winds and storm surge caused enough damage that the building had to be evacuated for another year. After a few weeks at the Jackson courthouse, Judge Gex went to work in Vicksburg. Judge Roper and Judge Guirola presided in Hattiesburg, and Judge Senter moved to Mobile. J. T. managed to scrounge the best accommodations of all for Judge Walker, who was the only Judge on the Coast whose home survived the storm. The exodus of casino workers freed up apartment space, and J. T. acquired three units. One of them soon housed the United States District Court’s Southern Division. Judge Walker made the master bedroom his chambers; his law clerks worked in the other two bedrooms; and the deputy clerk claimed the dining room. Within a couple of weeks, J. T. procured the leases, furniture, and IT connections. Best of all, according to Judge Walker, J. T. found a court seal to hang on the wall. It was an official court site, and so well guarded by plainclothes deputy marshals that the other residents assumed it was a drug operation. Not all of the courthouse issues have been moisture-related. During J. T.’s term as Clerk, the old Meridian and Vicksburg courthouses have been closed. In the case of Vicksburg, the courthouse moved to Natchez, which was the site of the original federal court in the Mississippi Territory. The project to convert Memorial Hall, an historic Natchez building, to a federal courthouse was complex, but Senior District Judge Bramlette credits J. T. with ensuring “that the new construction was accomplished with minimal disturbance to the original elements of the structure in order that the character of both the exterior and interior could be maintained.” In the case of Meridian, the 2013 closure forced the dissolution of the old Eastern Division, resulting in a complete re-shuffling of counties and cases. Changing the divisions requires, literally, an act of Congress, and a bill to accomplish the change has been introduced. If it is adopted before he retires, J. T. must preside over the resulting changes to the Local Rules and the jury wheel. J. T.’s clerkship abilities are, deservedly, celebrated both locally and nationally. Judge Barbour calls J. T. the “best Clerk in the country,” and says that hiring him was the best thing he did as Chief Judge. At the Capital Area Bar Association’s 2011 Annual Judges’ Banquet, J. T. received an Outstanding Service Award from the Mississippi Chapter of the Federal Bar Association, “For his outstanding service and continued dedication to Federal Courts in Mississippi, their judges, practitioners and the public whom they serve.” Also in 2011, he was given the Green Eye Shade Award by the Federal Court Clerks Association. The Award was created to honor Bob Christ, a former Clerk of the District of Oregon. It is presented “to a clerk of the federal court who has ‘best weathered the storm’ during the preceding year, in a manner most consistent with Bob Christ’s display of exemplary character and sound judgment, combined with an admirable sense of humor.” That’s right, J. T. was honored for his sense of humor. No one who knows him is surprised. J. T. is the person who would be the most disturbed if this became a thank-goodness-you’re-just-retiring-and-not-dead-but-my-doesn’t-this-look-like-an-obituary type of article. While we will all remember his abilities, we will most remember him for the man that he is, best demonstrated by his connection to his family. J. T. is a Jackson native who still lives, with wife Larry, in the house that his parents built. According to his daughter, Elizabeth, sports are a predominant interest in the Noblin family, and her father was willing to coach any sport that she and her brother, John, were willing to play. He was also willing to share his expertise with others; Elizabeth can still remember hearing his voice on the basketball court, imparting his wisdom to the referees. (“I would look up and see Mama tapping him on the leg and telling him to hush.”) Son John directs the Mississippi Blues Marathon; Elizabeth coaches basketball. His grandchildren, Keavy and Clayton, are also accomplished athletes, and those who know the Noblins understand that nothing is planned without first consulting the girls’ sports schedules. J. T. was a performer from childhood, and Larry reported that he was often “invited” to stay after school at Duling Elementary — the result of his entertaining the rest of his class. He appeared on stage at both Murrah High School and Millsaps College. His talents include art and writing, and, as the result of a part-time job while in college, you can thank J. T. for the “Call the Redd Man” jingle. He likes muscle cars and country music. No one interviewed for this article was willing (or able) to relate an embarrassing story about J. T. Apparently, either he never stood on a bar and belted out the Millsaps fight song (if there is one), or else he has the best friends money can buy. Since he was a Pike, I suspect the latter. Elizabeth describes her Dad as “giving;” but Larry said it best, “He has a servant’s heart.” As a church usher, he is known for his “curb service,” by which he fetches some of the more mature ladies from their cars and escorts them into the church building. At home, he has always been available to help his children, and now his grandchildren, with any project that needed doing. That spirit extends outside the home, as well, and J. T. has been a Fondren neighborhood supporter for many years. He and his late friend, Buddy Buchanan, were instrumental in getting the tennis courts and walking trail built at Parham Bridges Park in Jackson. It is written, that when NOAH, his family and friends and a few well-chosen animals finally saw dry land, Noah praised all on board for their faith and their courage, not so much some of the animals, but that’s a story for another day. Once the rains stopped and the great waters abated, Noah told his family and friends to go into the land and rejoice after their trial by flood. “Half of you,” Noah said, “celebrate your faith and courage on Friday while the others work. The other half,” he directed, “should celebrate on the following Monday, while the first half works.” And thus was born the traditional holiday, “Noah’s Long Weekend following the Flood,” which falls this year on Friday, July 23, and Monday, July 26, and is observed by those who have survived a great flood — or alternatively, a four-story soaking and three week dry-out. Peace. He can stop thinking about us soon, but we won’t reciprocate. No one who has worked for or with J. T. has been unaffected by the experience. Some people got positively misty-eyed when I approached them about this article. Several could not participate at all, convinced that ignoring J. T.’s departure would prevent its occurrence. Others of us are already preparing for the inevitable. I asked Larry recently if, when we needed a “J. T. fix” after he leaves, we could call the house and ask her to put on a pot of coffee. She sweetly replied, “The coffee’s always on here.” Get ready, Larry, we’ll be coming. Terryl is the Death Penalty Law Clerk and Administrative Staff Attorney for the United States District Court for the Southern District of Mississippi, and she has pledged to protect the confidentiality of all of the sources for this article.